1) I've enjoyed talking with our older kids lately about relationships and responsibility, and being careful with your heart (and body). "It seems like once God gets a hold of a person's heart, there's no turning back and they solidly stick to their convictions," I said, "When do you think God really got a hold of your heart?" To my surprise, our oldest thought his first week in college was a turning point for him. Seeing up close and personal how falling for worldly traps can harm a life, he realized his need for God. Pretty cool. Christians often worry about their kids going off to a secular college (and I am no exception), but in his case, it cemented what he believed. God can make anything work out for His good. 2) Our daughter's first response to "When do you think God really got a hold of your heart?" was "Missions trip" (We have awesome youth sponsors at our church--THANK YOU SAM AND BECCA! ), but then she added that going through problems and concerns with her friends in the last year made her look for answers in her Bible. Don't you love how God works?! 3) Have you bought into the phenomenon of Twitter? I have an account, but I still can't get into it much. I heard a story on K-LOVE this week about John Piper coming down on people who tweet during church. Apparently some people think of it as a great witnessing tool, giving the play by play of their worship service. Maybe I'm old-fashioned (am I really old enough to be saying that? sheesh! ), but it never occurred to me to tweet during church. Isn't worship a time for worship, not color commentary? Of course, I'm not crazy about the "w" word (as in witness) either, but that's a whole 'nother story. Don't get me going, unless you're wanting to duplicate the whole balance fiasco. 4) In nineteen days I'm getting away for a few days alone with my husband, but who's counting? 5) We had a fun afternoon at church yesterday. Our whole family was working in different capacities to prepare for our summer production. One kid was drawing pictures on his graphic tablet to be displayed between scenes. Two were practicing music for the orchestra and the other was helping me paint set pieces. It was really kind of cool, our whole family, happily doing what they do best, all in the same room for the same purpose. You can be sure I savored it. Who knows if it will happen again. 6) I'm happy to report I haven't cleaned a closet yet. Although, YET is probably the operative word. Bleh! 7) I absolutely LOVE the show So You Think You Can Dance? I am down right envious of the way those people can move. They're so beautiful, so graceful. I am mesmerized at their body control. I couldn't get my body to do those types of things without breaking a hip or traumatizing small children. Man, I wish I had that kind of expression and beauty. Wow. I'm afraid it's one of those skills you have to born with SOME aptitude for and I wasn't. I don't think the chicken dance counts, does it? Sigh. That's all she wrote this Friday, friends. 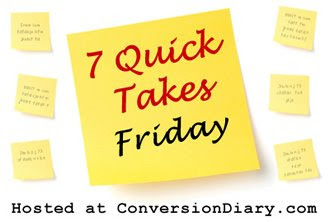 Read more Quick Takes at Conversion Diary. Have a great weekend. Thanks for your encouragement at my hormonal post!! !